If you’re unsure, you can compare your measurements to our sizing chart or speak to our stylists via our Live Chat facility in the bottom right hand corner of your page. An item I want to buy is sold out – will you be restocking it? All of our stock is limited and we do not restock products once they have sold out. We may receive some items back via returns, which will then be made available online – so keep an eye out! How do I use a discount code or a credit note? To enter a discount or credit note code, copy and paste the code into ‘COUPON/VOUCHER CODE’ box during checkout and hit 'APPLY'. Provided that your order complies with the terms of the offer, the discount will then be taken off your order total. Please note that discount codes do not work on Final Sale items. If you have an existing credit note, it will be available in your BNKR account and displayed as a payment option during checkout. A discount code can be used in conjunction with a credit note. If you are using a credit note code, just copy and paste the discount code into the box, hit 'APPLY', and then enter the credit note code. You’re logged into your customer account. The items in your cart meet the requirements for the promotion (i.e. they are full priced items; they total more than $100). The code has not expired. The items in your cart are not Final Sale, as Final Sale items are not eligible for further discounts. If you’re still having trouble, contact our Customer Care team at [email protected] and we can sort your problems ASAP. Only one of our discount codes can be used per transaction. However, if you have a credit note from a previous order, this can be used in conjunction with a promotional code. I forgot to enter my promotional code! What can I do? Unfortunately we cannot enter codes manually after an order has been placed. You’ll have to save it for your next order! I’m trying to sign into my account – help! Although you don’t need an account to make a purchase, you will need to create one if you wish to use a promotional code or track your order. Firstly, check that you have previously created a customer account – not just signed up to our newsletter! If you’re seeing the ‘invalid login or password’ message, make sure your email and password are correct. If you still can’t sign in, you can request for a password reminder to be sent – just follow the prompts on the page and enter your account email. If you’re still having trouble, contact our Customer Care team at [email protected] with screenshots of your issue, and we can sort out your problems ASAP! As our orders are dispatched quickly, we are unable to cancel or change the details in your order once it has been placed. Please allow 24 hours for shipping confirmation emails to come through, or until the next business day if ordering over a weekend. Sometimes our emails can wind up in junk or spam folders. Try checking there first and adding us as a contact to avoid this! You can also check that your order has gone through by logging in and viewing the ‘My Account’ section. All of our items are shipped via express post for your convenience! Your BNKR order will be dispatched same day if ordered before 10PM PST on a business day. Otherwise, it will be dispatched within 24 hours of being placed, unless placed over a weekend or on a public holiday - if this is the case, it will be dispatched on the next business day. Estimated time of delivery for metro areas is 1-3 business days, and 3-6 business days for remote areas. If you need further information, please contact BNKR Customer Care at [email protected]. Once your order has been dispatched, you will receive a confirmation email containing a link that you can use to track the progress of your delivery. We will also send you email updates along the way, so you know exactly when to expect it. If I’m not at home to receive my delivery, where will it be left? Your order needs a signature upon delivery, so if there is no one around to receive it the courier will leave a missed delivery card. You can then organise for your order to be re-delivered whenever it suits you! Shipping is free for purchases over $39 within USA, Canada and Asia. Please note that this applies to orders over $39 after any promotional codes have been applied. Why do I have two tracking numbers for my order? Occasionally orders will be split into two shipments and you will receive tracking information for both parcels. You will not be charged any additional shipping costs for split shipments. Please be aware that products purchased on sale can only be returned for store credit, and items marked Final Sale cannot be returned or exchanged, unless they are incorrect or faulty. Items purchased using store credit can only be returned for store credit, including full-priced items. 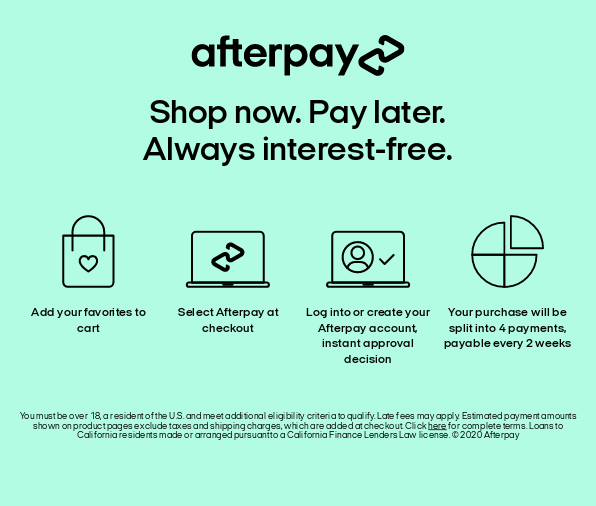 Purchases made with some discount codes can be returned for store credit only; when you input the code at checkout you'll be able to see the conditions for that code. Can I exchange my item if it doesn’t fit or doesn’t suit me? We can exchange your full-priced item for store credit, which you can use to purchase a more suitable size or style. Can I return my item(s) for a refund? Yes, full-priced items can be returned for a refund provided that they are in their original condition and meet all our return requirements (you can find them here). If a full-priced item has a promotional code applied to it, it can still be returned for a refund unless the conditions of the promotional code specify store credit returns only. When you input the code at checkout you'll be able to see the conditions for that code, including any return information for the offer. Items with reduced sale prices can only be returned for store credit, and purchases made with store credit can only be returned for store credit. Products marked Final Sale cannot be returned for a refund or for store credit (in the absence of any faults). I’ve lost my return form! Can I get a new one? No stress! You can download and print a new form here. All return shipping is the responsibility of the customer. We try to get through all returns ASAP, but once your return is received at our office, it may take up to 5 business days to process. Once a return has been received at our office, we will send you an email confirming that it has arrived. Once received, it can take up to 5 business days to process. When sending back your return we recommend you get a tracking number, just in case it needs to be tracked down. What do I do if I think an item is faulty? If you believe your item is faulty, please contact BNKR Customer Care at [email protected] prior to sending it back.